In the graph below the grey circles represent the US penetration (percentage of households which own) MP3 players. 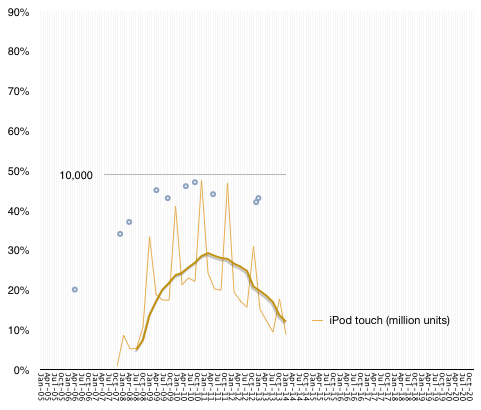 Superimposed on this sparse sample graph is a line showing the sales of iPod touch. This second graph has a different scale, shown with a gridline at 10,000, representing millions of units shipped by Apple. To smooth out seasonality I show the trailing four quarter average with a thick line. The correlation is fairly evident. 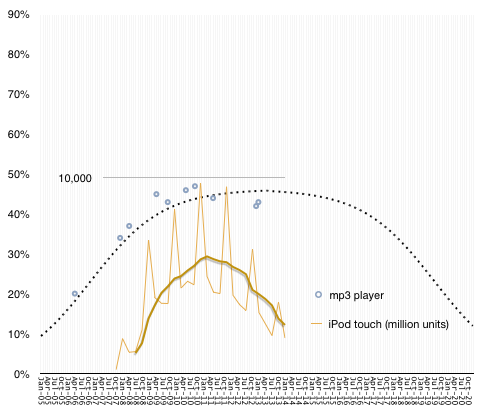 As iPod sales grew, penetration grew and “peak MP3” was recorded in September 2010 while peak sales occurred at the end of that year. It’s not a stretch to say that iPod touch sales are causal to MP3 penetration, especially since the iPod has remained the market share leader in the segment for a long time (at least 70% share) and that the iPod touch is consistently half or more of the iPod. The absence of data for penetration beyond 2012 is therefore not a problem. We can assume that MP3 devices have a finite lifespan and, if not replaced, the penetration will decline. As longevity goes, this is quite generous but it’s safe to say that fewer than 10% of US households will have a dedicated MP3 player by the end of the decade. MP3 players turn out to be a “ballistic technology”. Their failure is two fold: first, they did not reach saturation, gaining popularity with only half of US households; second, they were substituted and thus went out of use. Note that I kept the graph’s upper bound at 90%, suggesting the limitation of the device popularity. There are many technologies which are in this state: camcorders, pagers, VCRs, game consoles. On the other hand there are some technologies which prove to be both ubiquitous and resilient. I call these “perpetual technologies”. Substitution may occur but it may take decades. Examples are stoves, autos, microwave ovens, refrigerators, radios, vacuum cleaners, TV, telephones (fixed wire and cellular). Yet another category exists where the technology does not quite reach ubiquity but is common enough that it’s refused by only about 20% of the population. I call these “Inertial technologies”. They also have relatively long periods of slower growth and similar lengths of decline, sometimes substituted by services rather than equivalent objects. The Examples are washing machines, the Internet, personal computers. Some technologies never reach mainstream use (below 10% penetration). I call these “dud technologies”. These failures are very common and can be discerned easily. Examples include the Segway, Google Glass, SPOT watches, PDAs. Dud technologies: Never reach 10% penetration, are money losers, do not create an industry. Ballistic technologies: Reach between 30% and 70% penetration but are substituted quickly. They are profitable but only for the duration of their ascent. Generally do not create industries, ecosystems or network effects. Inertial technologies: Have steady growth but never reach ubiquity. They are bound by frictions which impede their broad adoption but also impede their substitution. They do create industries and network effects but suffer from corrosion and monopoly. Perpetual technologies: They reach ubiquity, usually quickly and remain there indefinitely. Substituted only by improvements which supersede performance (e.g. Color TV vs. B&W TV). Usually solve a universal problem everybody has. Create disruptive growth and have world-changing effects. Knowing in advance which category a technology will reach can be very valuable. Not only can investment be directed, but career decisions, education choices and fundamental research can be better allocated. The question is therefore how to tell early enough where an emergent technology fits in this categorization. 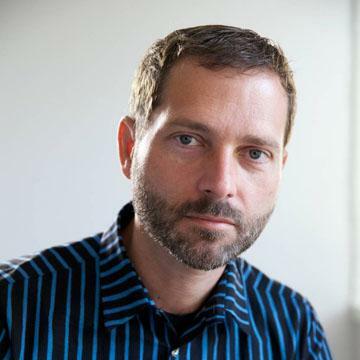 I’ll be discussing a methodology for doing this, the processes for creation and covering at least twenty case studies at the Postmodern Computing Summit in June in San Francisco.